I've not been back to Oso in a while, but I was impressed on my first visit, and hearsay leads me to believe that it continues to remain at the forefront of fine Italian dining in Singapore. 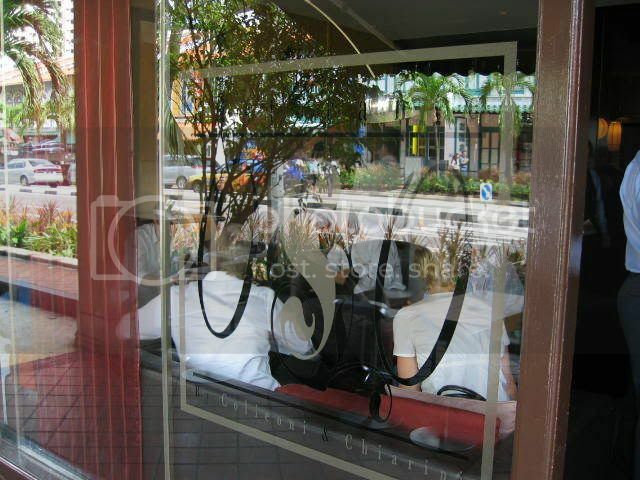 Oso is located on Tanjong Pagar Road, which is also home to other restaurants like Buko Nero. The restaurant also has a lounge area where you can sit and enjoy some drinks before your meal. The restaurant is extremely popular with bankers and lawyers entertaining clients on weekdays, so either make a reservation or come during dinner or weekends. Our lunch started with a platter of cold cuts, which Oso is particularly famed for. 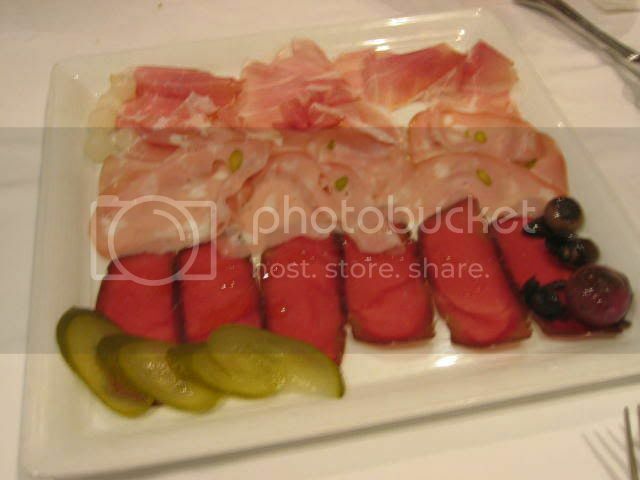 Their carpaccios and proscuittos are sliced to transparent thinness, drizzled with just a little extra virgin olive oil and served with gherkins and onions. Definitely a great way to start the meal. 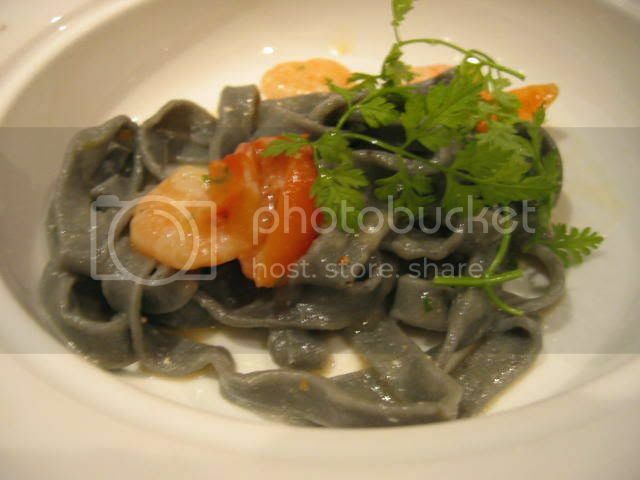 After which, we were served a squid ink pasta with shrimp. The tagliatelle was excellent, perfectly al dente with just the right amount of turgidity to give it bite. Nor was it intensely black as most squid ink pasta tend to be, rather, it exhibited a smoky grayness that prevented the unsightly staining of teeth, which tends to be characteristic of squid ink dishes. Our main course was a slow-roasted lamb chop, served with some toasted walnuts and onion confit. The lamb was sweet and meltingly tender, but unfortunately had a generous layer of fat on it, which, while contributing to the richness and succulence of the lamb, I could not really bring myself to eat. Since Christmas was drawing near, our dessert was a special Christmas cake - a millefeuille of fruitcake sandwiching light layers of chocolate mousse. I thought this dessert was somewhat lacklustre, and would have preferred a more traditional Italian dessert, but I suppose Christmas requires a special touch. Although the food wasn't as good this time round, Oso still remains one of the best Italian restaurants to go to in Singapore. 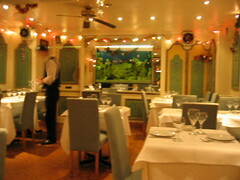 Service and ambience, particularly, make the restaurant a memorable dining experience. 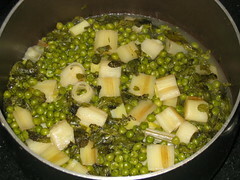 I think peas are very underrated vegetables. For some reason, everyone seems to shy away from them, and they're often thought to be mushy and overcooked. 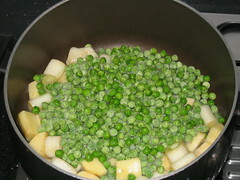 I've always thought peas had a geat, if subtle, flavour; and buttered peas make a delicious accompaniment to any roast. This time though, it was not buttered peas that I was after, but a new soup. I was getting bored with the usual pumpkin and mushroom and potato soups, so I thought I'd try something new and visually exciting; and nothing could be more visually interesting than green pea soup. 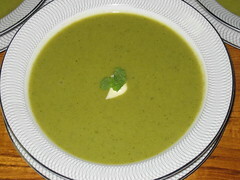 But that seemed a little ordinary, till I came upon a recipe in The Cook's Companion, edited by Lorraine Turner, for minted pea soup, which seemed to add just the pique I was looking for. Notes on ingredients: If you can't find shallots (and you usually can't in Singapore, you could probably just use one onion). 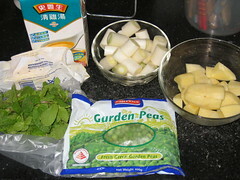 I used one handful of mint and didn't bother to chop it, and I used chicken stock instead of vegetable stock. Melt the butter in a large pan over medium heat. Add the shallots and cook for 2 minutes. 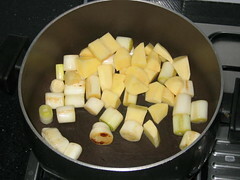 Add the leeks and cook, stirring for an additional 2 minutes. 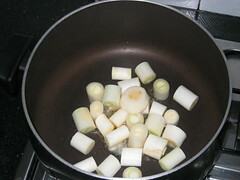 It doesn't really matter if your leeks get slightly browned, as you're not making a vichyssoise. Add the potatoes and cook for, you guessed it, another two minutes. And the mint; chopped, if you prefer. And finally add the chicken or vegetable stock. 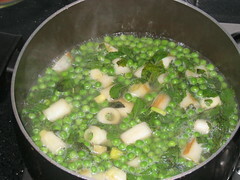 Bring to a boil, then reduce the heat, and let everything simmer, covered, for 30 minutes. After you're done simmering, remove the pot from the heat and let it cool down. 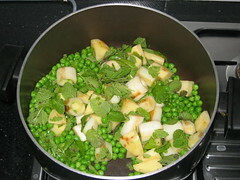 Don't worry if the peas and mint look rather discoloured; that's meant to happen. 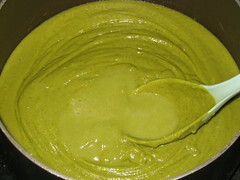 Transfer the ingredients to a blender and blend till smooth. You should get a thick, viridian paste. Return this to the pot and dilute with water or stock until you've reached the desired consistency. Heat it up and keep hot till you're ready to serve. Scoop the soup into bowls, dollop a teaspoon of cream or creme fraiche into the centre of the soup, and garnish with a sprig of fresh mint. I'm too lazy to do a day by day review of the restaurants I went to in London, since there weren't very many of them, so I'm just going to put them all in one post. Dinner one night was at Signor Zilli, an Italian restaurant that was reputedly very good for their seafood. They also run a bar next door where you can enjoy a postprandial tipple. The restaurant itself occupies two floors; the somewhat more active and noisy ground floor, and the quieter basement, which was where we sat. 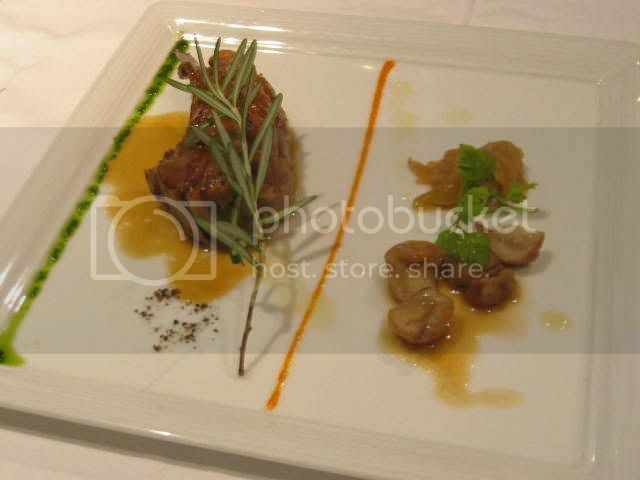 We started with some seared scallops, which were well-executed, if uninventive. 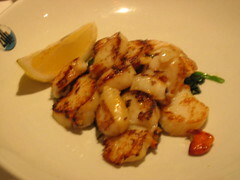 The scallops were plump and firm and fresh though, so the restaurant's reputation may have been well-deserved. 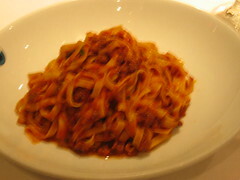 I decided to be boring and ordered a plate of tagliatelle alle bolognese, which I was pleased to find was both al dente and extremely tasty. While a pasta with bolognese sauce is not the hardest thing in the world to cook, it did show that Zilli's could handle more than just seafood. I could see why it was known for its seafood though, when Bjorn ordered the lobster pasta. 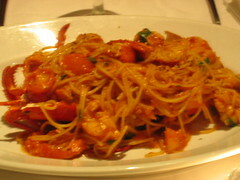 A huge dish of spaghetti, drenched in a rich seafood sauce and served with the meat and shell of half a lobster, this was incredibly fragrant and mouth-wateringly sumptious. At GBP 21 though, it was clearly a meal for special occasions. There seem to be an increasing number of Singaporean restaurants in London, which isn't all too surprising, considering that there is quite a sizeable Singapore and Malaysian expatriate community living in London, so it was only a matter of time before someone decided to cater to their dining needs. Bjorn and I, after a jaunt round Portabello Market in the morning, decided to have lunch at Nyonya, a Peranakan restaurant nearby. 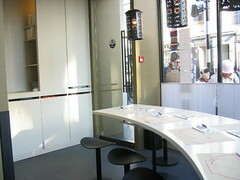 While the seats were not particularly comfortable, being nothing more than glorified stools, I liked the rest of the restaurant's design; lots of glossy white surfaces and plenty of light. Rather modern for a "traditional" Nyonya restaurant. 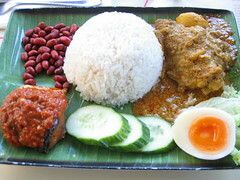 I had a Nasi Lemak, which was also not extremely traditional, since it was served with curried chicken and a boiled egg. Still, it was quite delicious and very comforting to have some local food after having to subsist on poor hall food for so long. 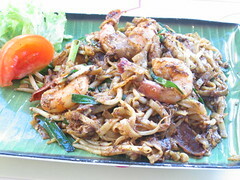 What was really good though, was the char kway teow. 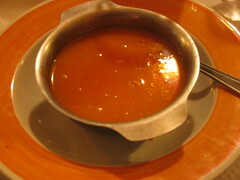 The sauce was thick and rich and it was really incredible, better than lots of char kway teows I've had in Singapore. It even had an authentic wok hei that gave it depth of fragrance and just a hint of smokiness. Seriously good stuff. Though at GBP 7, I suppose it had better be good to be worth it. 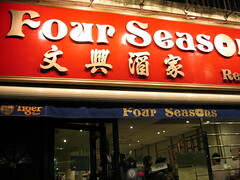 Of course, what trip to London is complete without an obligatory dinner at the Four Seasons Restaurant at Bayswater? While service is invariably indifferent, and you always have to wait for a table (reservations are a must), there's one and only one reason people come here to eat, and it explains why the restaurant is always fully-booked. Just as Hong Kong has Yung Kee's famous roast goose, London has Four Seasons' equally famous roast duck. The roast duck here is really good. I've yet to come across another restaurant that does a better roast duck. I don't know what their secret recipe is, but the duck is juicy and succulent, sweet and tender, yet not disgustingly fat and oozing with oil, as some other roast ducks tend to be. 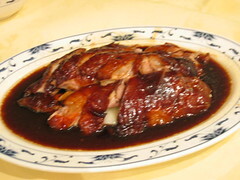 The consistency of Four Seasons' roast duck is just as impressive; you will never find a dry or chewy morsel of duck here. 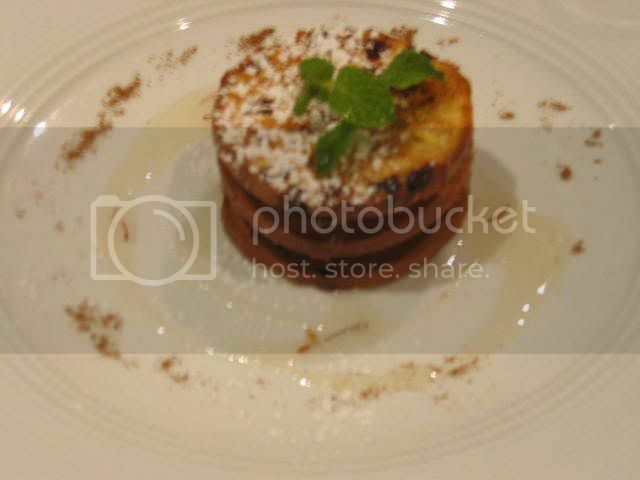 All the other dishes, unfortunately, are not as laudable, but help to fill you up. Save the best for last, they always say. 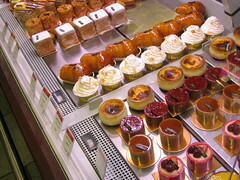 Respecting that trite maxim, I made sure that my last day in Paris would be filled with its most compelling bakeries and patisseries. Going to Paris without having macarons from Ladurée is the culinary equivalent of going to London and not watching a production. They're both fairly expensive (a box of seven macarons will set you back €11) and over rather quickly, but they're both extremely enjoyable and make you seem very sophisticated. Ladurée was bustling with activity; the number of customers trying to purchase a box of macarons at any one time was quite astonishing. 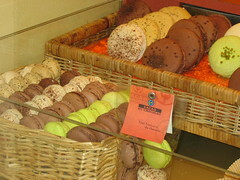 And the macarons themselves! An amazing panoply of colours; deep reds, blushing pinks, inky blacks, hazelnut browns, verdant greens and toffee browns all laid out in clear boxes, waiting to be scooped out of their plastic nests and into the anticipating hands (and mouths) of the impatient customers. 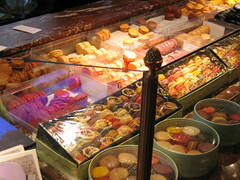 There were so many macarons in that small space that a diabetic could have become hyperglycaemic simply by breathing. Some of the must-try flavours from Ladurée include their orange blossom, chocolate, strawberry and pistacchio. Steer clear of their réglisse and mille et une nuits unless you're fond of liquorice and harissa. Lunch was at L'Etoile Vert, apparently a bistro that's been serving reasonably-priced meals for the better part of two decades. I've never seen soup served in a metal bowl before, but I suppose when one pays less, one should expect fewer accoutrements as well. 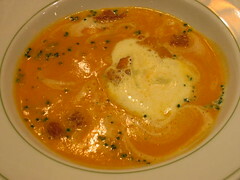 In any case the tomato soup was hearty and robust, and a welcome change to the many bowls of pumpkin soup I'd already had. 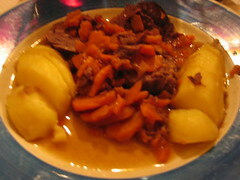 My main course was another braised beef dish - this time with carrots and potatoes. I am very fond of braised beef, because slow-cooking really coaxes the flavours from the meat and breaks down all the tough sinews that sometimes can plague even the best cuts of meat. It's almost like external digestion. While not terribly sophisticated, that's the whole point - braised beef announces its rustic charms, and nothing says rustic like potatoes and carrots. My only beef (sorry, couldn't help it) was that the accompanying sauce was a bit too thin for my liking. 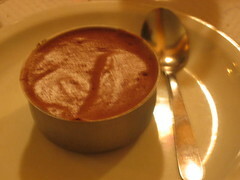 Dessert was a simple, straight-forward chocolate mousse, which was airy without being ephemeral. Again served in a metal container, this was starting to bother me at the point. 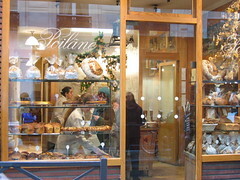 After lunch, we paid a visit to the oldest boulangerie in Paris, Poilâne. I was somewhat surprised and disappointed to find that they occupied such a small shop space; I had expected them to be an immense, bread-making factory straight out of Charlie and the Chocolate Factory. Although famed for their huge, 2kg miche Poilâne, I contented myself with a small, savoury apple tart from the venerable, world-famous bakery. Somehow the irony appealed to me. While I did stop by Le Bon Marché's Grande Epicerie, the smorgasboard of fresh produce and gastronomic products was slightly gratuitous by this point, especially since I wasn't actually buying any of it. Definitely worth a stop if you're in the area though. By late afternoon, it was time to pay a visit to the one chocolatier and patisserie in all of Paris I'd been dying to go to, named for its eponymous owner and enfant terrible of pastry, Pierre Hermé. 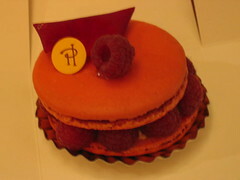 Unlike Ladurée, Pierre Hermé is located in a very modest district, and can take several tries to find. Despite this, the boutique is no less busy, and there is a constant queue for his macarons, which at €9.50 for 8, are cheaper than Ladurée's. Naturally there was no way I was going all the way without trying Pierre Hermé's signature Ispahan; the famous rose-flavoured palm-sized macaron, encrowned with deep crimson raspberries. One bite into the crisp pink shell, and even before your teeth sink into the rosewater-scented cream, before you feel the explosions of slightly-tart sweetness as the raspberries burst upon your lips, you become aware of the incredible complexities of this classic. The immaculate blending of textures; from crunchy to soft, the perfect mixing of flavours; rose, cream, raspberry and lychee, and the most beautiful scent all strike your senses and linger even after the macaron is long gone. It is this dedication, sensitivity and artisanal quality that you find in all of Pierre Hermé's macarons that truly set them apart , and it is then you understand, if you haven't already, what the fuss is all about, and why the culinary world goes slack-jawed at every new creation. If you're looking for a culinary experience, or the best macarons you've ever had, you'll probably find both at Pierre Hermé. Apparently Parisians take their food quite seriously, or at least, so Lonely Planet would have you believe. I was having some doubts about that after eating in some of the more questionable bistros. La Librarie Gourmande changed my mind though. 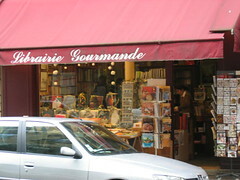 Paris is full of little bookshops, but this is the only one entirely deveoted to food. Almost any cookbook you could probably want can be found here. The only drawback, of course, is that most of them are in French. Still, a good number of them are in English, and even the French ones look mouth-wateringly tantalising. I could have spent the entire day in that bookshop, among Escoffier, Robuchon and first-edition copies of Larousse Gastronomique. Unfortunately, though, I had other things to do, and so I had to be happy with buying myself a copy of Pierre Hermé's Chocolate Desserts. One of the things I had to do was to visit Galeries Lafayette. Not to go shop or anything naff like that, but to go gawk at the gourmet section of the very posh grand-magasin. There was certainly plenty to gawk at. 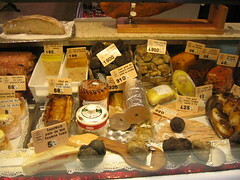 The foie gras counter alone boasted an amazing assortment of livers, patés and terrines. Guaranteed to give any animal-rights activist apoplexy. 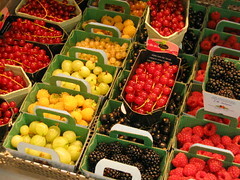 Then there was the beautiful fruit display; blackberries, raspberries, red currants, gooseberries - all manner of globules, bursting with colour and swollen with ripeness. Some of the fruits on display I'd never even seen before, let alone tasted. Of course, what's a spread without sweets? Paris boasts a multitude of patisseries on every street corner, but the pastries and desserts of Sadaharu Aoki, with their seductive glazes and perfect presentations, simply take the cake. I rather foolishly left Librarie Gourmande without eating lunch, in the mistaken assumption that I would find a bite to eat at Galeries Lafayette. Of course, the prices there tend not to be too encouraging, so I was left with the option of walking around the neighbourhood in search of lunch. Luckily, there were a few bistros in the area catering to un-savvy tourists looking for a simple meal. 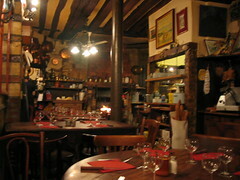 One such was Café Bistro, which attracted me with an offer of coq au vin. 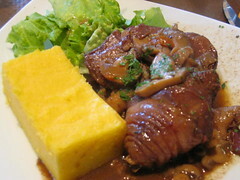 I have a soft spot for coq au vin, and the one I had here was quite good. Flavourful and tender, the chicken was a breeze to eat and came with almost all the traditional accompaniments; mushrooms and bacon lardons, but unfortunately no onions. 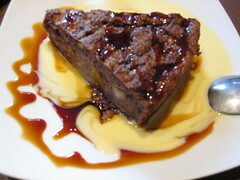 I wasn't entirely sure about the polenta though, as it came in one big cake and there was far too much of it to finish. 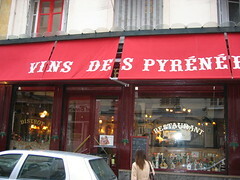 Paris is not the city to be too adventurous, especially where food is concerned. Since I wasn't entirely sure what the desserts of the day were, I told the head waiter to get me "something with chocolate". I think he assumed, by my bad French, that I had to be English, so he took it upon himself to find me some "pudding au chocolat". Incredibly, it turned out to be a real English chocolate pudding; extremely stodgy and heavy. While I certainly couldn't finish it, I was quite amused by his attempt to make me feel at ease. The rest of the afternoon was spent in the company of more food emporiums. I once had to do a French comprehension passage on Fauchon and Hédiard, so it was only natural that I pay a visit to these two eternal rivals of gastronomy. 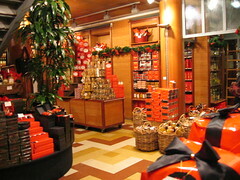 Fauchon was evidently in full preparation for Christmas; with beautifully-wrapped hampers lining the walls and stacked literally from floor to ceiling. 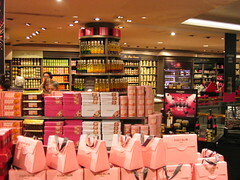 The entire shop space was dominated by the distinctive fuchsia of the luxury food company. Not to be outdone, Hédiard was clearly also gearing up for the holiday season. Their hampers were just as classy in their striking orange and black, and both stores clearly reflected the near-manic food consumerism that's only to be found in Paris, and perhaps the food section of Harrods. Only a few doors away is La Maison de la Truffe, which, as its namely obviously implies, is devoted to the cult of the truffle. 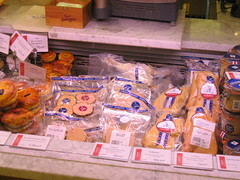 The display window alone contains what must be several thousands of euros worth of black and white truffles of obscene dimensions, as well as other truffle-complemented delights like foie gras, smoked salmon and sweetbreads; giving a whole new meaning to the French term for window-shopping, "faire du leche-vitrine" (to lick the window-display). I'd really been looking forward to tonight's dinner. A friend had recommended this restaurant as offering the best value dinner in Paris, and at six courses for €38, I'm inclined to agree. 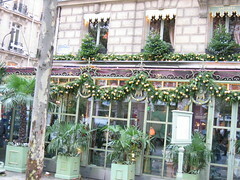 The popularity of the restaurant, L'Os à Moelle, was such that a reservation was absolutely imperative. Dinner commenced with an amuse-bouche of porcini espuma, chicken broth and chestnuts, very similar to Sage's signature chestnut and oxtail soup. That little sense of familiarity was an added bonus to the already excellent amuse-bouche. 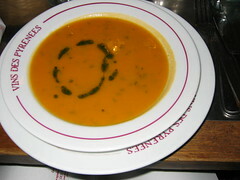 The soup course was a pumpkin soup served with some compté cheese. The melting cheese served to enrich the soup and enhance both its hearty flavour and velvety texture, an interesting variation of the normal dollop of cream or creme fraiche. I'd been bemoaning the fact that I wasn't getting any foie gras in France, so I was quite happy to be served a traditional confit of duck foie gras with a toasted crôute and beet salad. 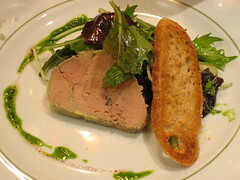 The foie gras was smooth and rich, nicely offset by the well-dressed and sweet salad. 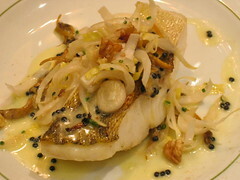 Every multi-course meal needs a fish course, and in this case it was a pan-fried zander, served with chanterelles, caviar and endive salad. I'm not a big fan of fish, but the fish was perfectly-cooked; none of the toughness or flakiness commonly associated with poorly-cooked fish was in evidence. The only fault I could find was that the accompaniments to the fish were very strong, and may have overpowered any taste of the fish. 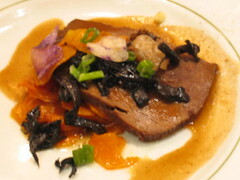 The main course was a braised paleron of beef, served with bone marrow, carrots, purple potatoes and trumpets de mort. Even though the beef was not very large (in fact the portions were well-sized, neither too generous nor too parsimonious), it was meltingly tender, sweetened by the carrots, enriched by the bone marrow and mellowed by the black trumpets. All the elements worked well together, and it was quite delicious. 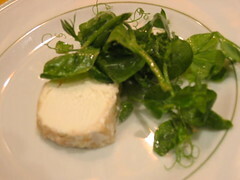 Traditionally, a cheese course arrives before dessert, and this was updated and presented as a goat's cheese salad. The slight tartness of the goat's cheese and the cleanness of the salad assumed the function of a palate-cleanser, helping to prepare our appetites for dessert. 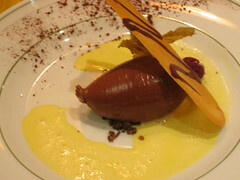 The meal rounded off with a quenelle of chocolate mousse, served with a saffron-scented creme anglaise. 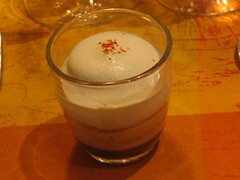 The mousse was more of a creamy marquise, delectable and smooth; a fitting end to a very satisfying meal. Lunch was originally supposed to be at Les Grand Marchés, a café at Place de la Bastille (which would have been the perfect segue had the market been open), but with all the luck in the world, the café turned out to be closed. Luckily, I had learned from the lessons of the previous days, and my back-up was Les Vins des Pyrénées, a bistro not too far from where we were. Thankfully, they were open, and so we installed ourselves for a comfortable lunch. My first course was a pumpkin soup, which didn't really break new ground, but it was quite competently prepared, and satisfying on a cold blustery day, even though it was not very hot. Oddly it tasted somewhat carroty, which is unsurprising since carrots are a natural addition to pumpkin soup, but I did think the pumpkin flavour was somewhat overpowered. 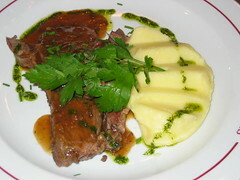 My main course was a slice of roasted leg of lamb with thyme and mashed potatoes. I've always wanted to roast a leg of lamb (Anthony Bourdain has an awesome seven hour leg of lamb recipe I've been dying to try), and after trying this tasty morsel, I'm quite convinced that it would be an excellent main course - the lamb was succulent and served with a rich sauce. The rest of the day was spent walking around Paris, exploring assorted food-related joints, such as A L'Olivier, a boutique specialising in olive oils and vinegars. The aroma of the shop was wonderful, with the fruity and oleaginous notes of the various oils blending and wafting to form one unctuous, mellow perfume. Another place we popped into was Cacao et Chocolat, a chocolate shop with a South American theme - many of their pralines had Aztec designs and motifs. I was particularly attracted by their macarons, and bought a few, in order to compare them to the ones I was looking forward to from Ladurée and Pierre Hermé. Cacao et Chocolat's macarons actually weren't too bad, but certainly weren't as attractive or imaginative as their more famous cousins, as I would find out the day after. Next stop was Mariage Frères, where I was quite surprised at how seriously Parisians took their tea. 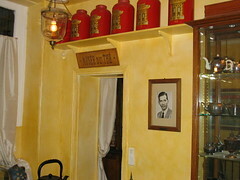 I always thought the French found tea relatively unsophisticated in comparison to coffee and chocolate, but this venerable teahouse was a clear indication that tea was obviously a respectable drink and a valuable commodity. We went to Robert et Louise for dinner, supposedly a countryside-styled, traditional restaurant, complete with fireplace and leaking rafters. 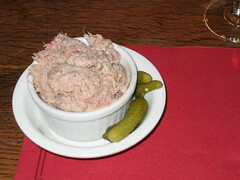 An old-fashioned eatery calls for old-fashioned food, and there's nothing new-fangled about pork rilletes. Just a lot of pork fat and liver. Coarse, sinewy and porcine, the rillete was very nice. 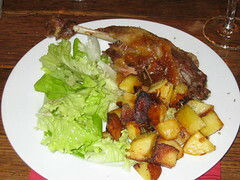 Equally old-fashioned was the duck confit, served with roasted potatoes and some lettuce. While the duck confit was falling off the bone, I was slightly disappointed that the skin wasn't crispy and crackling, as is usually the case here. Apparently the house specialty is a massive côte de boeuf that is roasted over the afore-mentioned fire, and is enough to feed two.